Wiki says: "Jealousy is an emotion and typically refers to the negative thoughts and feelings of insecurity, fear, and anxiety over an anticipated loss of something that the person values, particularly in reference to a human connection. Jealousy often consists of a combination of presenting emotions such as anger, resentment, inadequacy, helplessness and disgust." Recently the word "jealousy" has been appearing along with the thoughts to write something about it, so that maybe something could be seen. 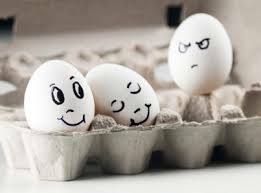 In the picture above with the eggs, there is a look on the one eggs face that may imply that it is mad that the other two eggs are together, or maybe it is upset that they are resting and it is not, or that they look content and it is not. The underlying thing of jealousy is that someone or something has what you don't and that you want it. The quickest way to see jealousy without having to change it, is to see that there has to be a story about "you" to have the emotion labeled "jealousy" without the "you" story … jealousy is just an emotion that is labeled. And to take it a step further, emotions are just energy; like a wave that rises and falls (one doesn't try to change a wave, but many try to change emotions, instead of just letting them be until they subside). So jealousy can be great tool for watching emotions rise and fall without doing anything about them. To just have them. And it can be a great tool in the seeing that there is no "you" to be jealous, for when the depth of this realization comes, you will laugh that you were always and only jealous of your own self. That might be a big jump but let's look, if you find that there is no "you (no individual you)" then you begin to realize at the same time, that it is the same for everyone and that the "sameness" that annimates the appearance of "you" is the "same" in everyone. In this seeing, or just Knowing, you don't have to see it, because in the world it appears as if we are all different and separate, but that is only because the attention is on the "world" and not what the world appears "IN." That doesn't mean that you might not still feel the emotion as real, but you will know who you are jealous of; and in That Recognition once again rest in yourSelf. Jealousy usually appears when there is either a fear of loss, that something you have or want will go to someone else, and it also appears when one does not feel adequate enough to retain what one has. So the goal of this writing, if there is one, is to help the reader begin to use jealousy, when it arises, as a way to bring the attention back to theirSelf, instead of projecting it outwards. You can use any example of jealousy. I just had one the other day and it was with my own child. We both took a motorcycle class, we both drove bikes for two days, we were tested on our riding abilities and on our studies. He passed both tests with flying colors and rave reviews from the instructor. I on the other hand did not pass the written test and just barely passed the driving. He was thrilled, as was I for him, and yet at the same time, the feelings arose of not being good enough, that my son was better than me, that I was not good at anything in life, that I was a failure (Now you can look at all those sentences and see that if you remove the word "I/me" then all that are there are thoughts and feelings, but with no one to place them on they would just rise and fall, but with an "I" they stay around because they have someone/something to stick too.) The more one can begin to see the "I" thought as an illusion, the less energy and intensity emotions have. The gift in this jealousy arising was the opportunity to once again see that it takes an "I/me" to keep it alive and without it, life just happens and moves on. It only stays (the emotion) if it is kept fed with the "I/me" thoughts. You could also look at the "other" that you are jealous of and KNOW without understanding...that it is yourSELF in another form that is receiving it, and therefore, what would you keep from yourSelf? This may not ease your discomfort but if you are coming from the space of WHO YOU ARE then it will, but if you are coming from the space of "who you think you are" then it can be quite challenging to see and let go. So begin to place the attention on "who you are" by discovering who you are. When you hear the words "I/me" begin to allow the possiblity that it is a lie and all thoughts that attach to it are also lies.